DeWalt Circular Saw review.The fast-paced life and technological advancements have led to innovations in home maintenance. In the past, the traditional means to maintain, build and renovate homes would take forever to finish. This is because of the hand tools that are hard to manoeuvre, take too long to use and require much effort to work. Today, power tools have taken over most of the hand tools we had in the past. They’re more efficient, durable and faster. 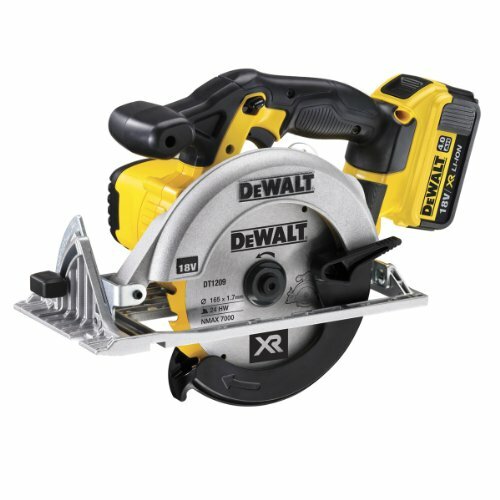 One of the companies that manufacture top of the line power tools, DeWalt, has created one of the best power tools I laid my hands on – the DeWalt 18V 165mm XR Lithium-Ion Body Only Circular Saw. Many individuals want to make sure what they purchase online is in top shape and good quality. The company’s new circular saw is the perfect example of potency, power, modern design and quality. Now, let’s see if this power tool set is worth the price. Does not come with a blade release tool. Whether you need to cut through thick or thin structures, build a new furniture, renovate your home or cutting sheet materials, this is the product to beat. It’s sleek and durable design is one of its strongest points. It uses the new XR Lithium-ion technology that is designed for efficiency and performing faster than other saws in the market. It has a durable cutting power that can cut through anything. Handy and portable because of its battery power, you can carry this power tool anywhere inside the house without the pesky cords and plugs. The motor housing is tight with incredible high-quality parts. The blade provided gives top notch cut, the aluminium plate is easy to set, and all parts holds each other tightly. It’s a safe tool to use, but it comes with safety warnings too. This is truly worth every penny because aside from its efficient work, I am sure it will last a long time. The saw contains high-quality parts that can last you a long time. The durability of the circular saw, and of course, the other parts of the product look and feel durable. For me, personally, I am looking at how long a tool will last, even with continuous use. I prefer tools that will last a long time even if it’s expensive. When they’re expensive and manufactured by a renowned company, you are sure that’s it’s made of only high-quality products and good craftsmanship. I don’t want to waste my money over affordable and cheap tools but can’t promise quality work. DeWalt is well-known for its various high end and durable power tools in the market. When it comes to quality and materials used in producing these tools, the company has a reputation to uphold. One of its finest power tools I laid my hand unto is the DeWalt 18V Circular Saw, which contains a highly-effective PM58 fan-cooled motor with brushes that can be replaced. These can deliver up to about 3700 rpm for extremely fast cutting applications using the 165mm TCT blade. The strong device design includes a cast magnesium base for recurrent precise cuts and an ergonomic handle set for increased user convenience, safety and comfort. It also has a rubber over mold to make sure it can be handled easily. Another sleek feature of this circular saw is its smart trigger action, Keyless bevel angle, and depth of cut tuning. It has an easy to read gauge that allows for extreme cordless flexibility. Lastly, it has an ultra thin kerf which is just 165 millimetres and a 24 tooth carbide tipped blade. This allows for a more efficient runtime and a fast and smooth cut finish. The saw’s blade itself is a legit and top notch. It is impact rated, which means that it can withstand a hell of a lot more friction and impact than other circular saws on the market. The blade is so excellent; it can cut through anything with accuracy and a smooth finish. This is important because for me, using low quality and low-grade blades or saws might ruin my project. I need a 100-percent accurate cut. This makes the life of interior designers, carpenters, DIY dads and a handy-man easier and less stressful. The saw can go through even hard surfaces without creating uneven lines and cuts. With various applications, this power tool is a must-have in the house. I used the saw a couple of times already, and it did not disappoint me. The performance is definitely a 10 out of 10. Despite a few flaws, which is expected in other products too, I strongly recommend the DeWalt 18V 165mm XR Lithium-Ion Body Only Circular Saw. If you’re someone who needs these kinds of power tools at work and in the house, this is the perfect tool to purchase. Regarding its build and design, it’s definitely a well-designed tool. Moreover, the performance and features of the saw are outstanding, in fact, they’re perfect. It weighs 3.8 kilograms, which is not bad for a circular saw. You can carry them anywhere since they’re battery operated – what else can you ask for? Priced at just $136, this power tool is worth your money. If you want something that is worth every penny and can deliver what you expect, this circular saw is the product you won’t regret buying. There are many power tools in the market but it’s difficult to actually rely on the features stated in the product’s specifications. However, the DeWalt circular saw is not like other products in the market that’s inefficient and can’t withstand high-pressure activities. I hope this review will help you decide to purchase the DeWalt circular saw because it’s worth it. You will work with your construction projects without troubles and frustrations. Whether you’re doing DIY projects or bigger construction works, having a robust and durable set of bits is essential and imperative.